A veterinarian in Arkansas has kept a dog from going out with a bang. This was after the animal ate 23 live rifle rounds. Benno is a 4-year-old Belgian Malinois. 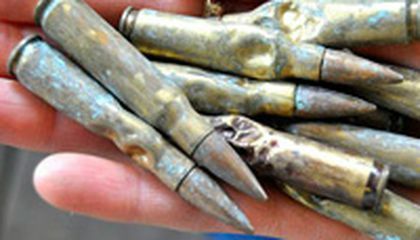 He had surgery to remove the .308 caliber ammunition from his stomach. The story was reported by The Baxter Bulletin newspaper. Owner Larry Brassfield said Benno has eaten socks, magnets and marbles. He didn't expect the animal would bother a bag of bullets. He had left it next to a bed. Brassfield and his wife realized Benno needed medical attention after the pet vomited up four rounds. Veterinarian Sarah Sexton at All Creatures Animal Hospital in Mountain Home removed 17 rounds from Benno's stomach. She left two in his esophagus. The dog was allowed to discharge them on his own. "This is something they certainly did not cover in school," Sexton said. "I've had dogs eat things before, mostly stuffed toys. Once I had one swallow a hearing aid. But I think this takes the cake." Brassfield said he won't leave ammo lying around anymore. But he isn't optimistic that Benno will stick to dog food. I would be mortified if my beloved dog ate ammo.Also trying to think that my dog might die or even blow up.It is not just one bullet ,that would be able to take out easily,but this dog Benno ate 23 bullets that would be so scary i would not know what to do. I would be too scared and worried that my dog might die. how can a dog swallow .308 caliber bullet? If I were the owner i would wonder how they physically swallow and chew a bullet. how can the dog like......... not blow up? Wow! I never knew a dog could 23 pieces of ammo! With out getting hurt, or getting put down! I would be very concerned of what I leave around when I have a dog, that eats everything! I am very happy that the dog survived! I think the dog is very lucky to have survived , but nonetheless I think that you always have to be careful if you have pets, especially with bags having such dangerous things as ammunition as this is very attractive for dogs, they may think it is a toy or food scraps and they can eat. How can the that dog eat ammo will it die from that. This text tells us about Benno a dog who lives in Arkansas who ate 23 live rifle rounds. his owner says Benno has eaten many kind of stuff but he thinks those bullets are too much, its veterinarian thinks the same she says she has seen many dogs whom has eaten toys and even a hearing aid, she says Benno took the cake. Benno for me is a lucky dog he has a minor procedure in his stomach and now he's fine but his owner must be more worried about the things he leaves on the floor or within Benno's reach. Why wasn't this procedure covered in Sarah Sextons school? I guess it is because this case is very unlikely to happen so she never learned about dogs eating rifle rounds. 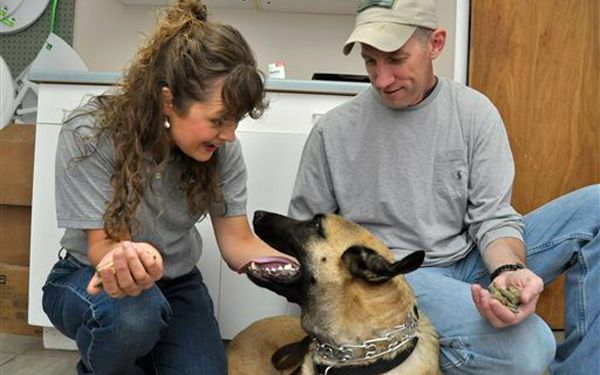 This article talks about Benno, a 4-year-old Belgian Malinois who ate 23 live rifle rounds. He had surgery to remove the ammunition from his stomach, he had eaten things like socks, magnets and marbles before but his owner Larry Brassfield didnt expect something like this. Brassfield and his wife realized Benno needed medical attention after the pet vomited up four rounds. The veterinarian Sarah Sexton removed the ammo from Bennos stomach. This is something that certainly did not cover in school, said Sexton. Brassfield had tried to Benno-proof the house before but he failed. Critical thinking challenge: because this is really weird for a dog to eat ammo, and they dont expect this to happen.